Adora A. Turnsplenty is a Secretary for Pryor Public School 2 and 3 in Pryor, Montana. 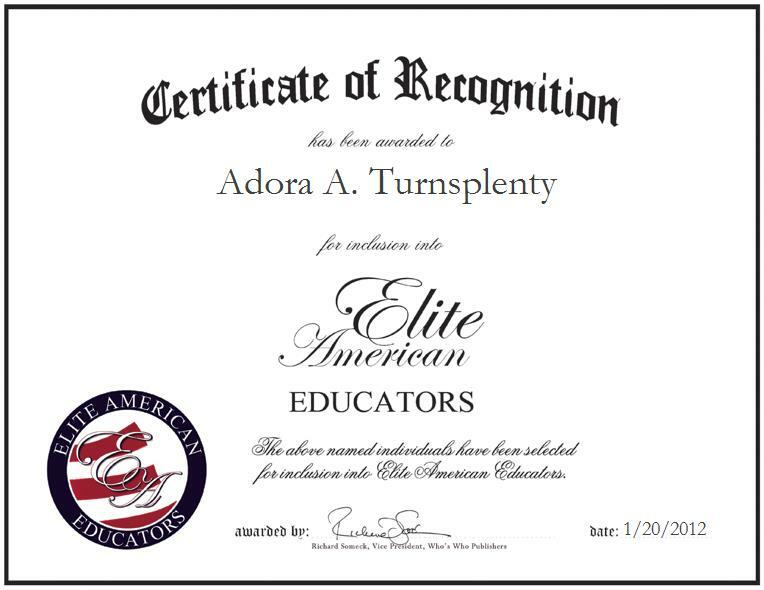 Ever passionate about supporting the orderliness and functionality of the educational institute, and in effect, helping students to thrive in a learning environment where they feel safe, nurtured, valued and appreciated, Ms. Turnsplenty specializes in administration and education, and in maintaining order. She currently serves as a liaison, oversees computer inputs, speaks with teachers, and answers the telephone. In her current capacity, Ms. Turnsplenty feels inspired by the students that attend the school, as she feels that they keep her going by learning and growing every day. She was moved to pursue her current career path by her own children, who attend the school; they continue to motivate her by gaining the knowledge that they need to become successful in their future. Ms. Turnsplenty looks forward to going back to college and obtaining a teaching degree in her foreseeable future.